Once and for all we are going to stop saying commit or committed suicide. Join us in the #stopsayingcommit campaign. Share this with all media outlets, friends, family, co-workers, your favorite celebrities, …everyone. Together we will break the stigma and change the language. 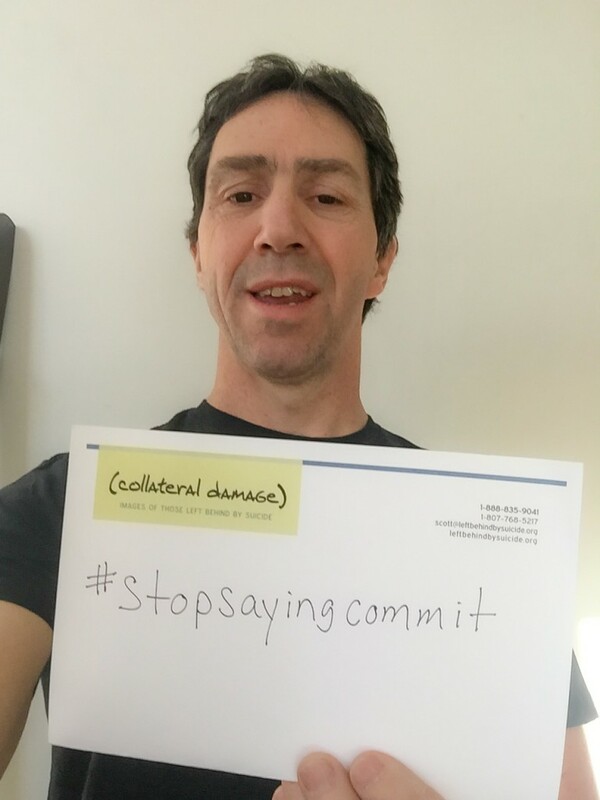 Take pictures with the tag line #stopsayingcommit and share it, share it, share it. If you volunteer, work or are associated with an organization in any way…include what you do in your picture. First responders, I want to see ambulances, police cars and fire trucks in your pictures with #stopsayingcommit. I want your office pictures. I want sports teams standing up to say #stopsayingcommit. I want you to say #stopsayingcommit LOUD AND CLEAR. Where ever you are in the world, start your own #stopsayingcommit campaign. Comment and post your pictures below and share your links with us. Together, we will once and for always #stopsayingcommit. This entry was posted in Blog, News, Uncategorized and tagged #stopsayingcommit, stigma by Scott Chisholm. Bookmark the permalink.